In Fox Interview, Cain Says He'll Decide Campaign's Future In Next Week : It's All Politics Herman Cain says he can't guarantee that more women won't come forward because he's helped many. People may expect him to drop out, but he says, "That's just not me." 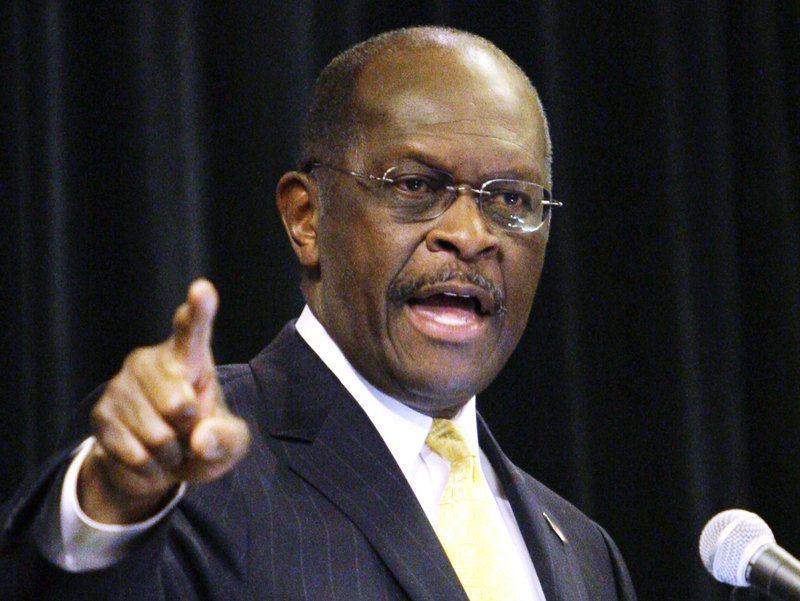 Republican presidential candidate, Herman Cain campaigned Wednesday in Dayton, Ohio. He told a Fox News interviewer he would decide in the next week whether to stay in the GOP race. Embattled GOP presidential candidate Herman Cain says that the future of his campaign will be decided within days, and hinges on whether his family can weather the scrutiny that comes with a run for the White House. During an appearance on Fox News Wednesday afternoon, Cain said that his "No. 1 priority" in coming days will be assessing whether to proceed with his effort to win the Republican nomination. Cain's once-ascendant campaign was rocked this week by an allegation he carried on a 13-year extramarital affair with an Atlanta woman. The claim comes just weeks after revelations of past sexual harassment complaints against him. Cain, who characterized the allegations as "character assassination," says they have had a "very damaging emotional effect" on his wife of 43 years. And, pressed by Fox's Neil Cavuto, he said he can't guarantee that other women won't be coming forward. "I can't sit here and say, after working in business for over 40 years, that someone else may not come up with another other trumped-up charge," Cain said, attributing the harassment and affair allegations to a conspiracy of Democrats trying to "knock me out" because they'd rather see Newt Gingrich capture the nomination. "My star was shining and rising too fast," he said. "They wanted to take some of that shine off." Cain said that his success in business over 40 years and his desire to help others led him to give money to Ginger White, the woman who claims to have had an affair with him. "Over the years, because I've been successful, I've helped many people financially," he said. He says he considered White a friend and gave her financial help over 2 1/2 years. "This Ginger White was having financial problems," he said. Cain, who has seen his poll support plummet in recent weeks and heard calls from within the GOP to step aside, says he has received many supportive emails this week. He told Fox that his campaign has been pulling in about $100,000 a week — a fraction of the $1 million a week he was getting when his candidacy took off in early fall. When politics gets rough, he said, the media and political elites expect candidates to drop out. "That's just not me," Cain said. "The people aren't saying that I ought to drop out." When asked by Cavuto why the harassment and womanizing allegations tend to "pile up" around him, Cain said: "Maybe I'm the Democrats' worst nightmare if I win the nomination," noting that the allegations all surfaced after he rose to the top tier of candidates. He characterized White's affair allegation as "totally out of the blue." When asked what he told his wife, Gloria, about White's allegation, Cain said that he's "told her exactly what has happened." She will figure heavily in his decision. "I'm listening to my family and the people first," he told Cavuto. "A week from now I will have made a final decision."